Magnetic Resonance (MR) imaging-based motion and deformation tracking techniques combined with finite element (FE) analysis are a powerful method for soft tissue constitutive model parameter identification. However, deriving deformation data from MR images is complex and generally requires validation. In this paper a validation method is presented based on a silicone gel phantom containing contrasting spherical markers. Tracking of these markers provides a direct measure of deformation. Validation of in vivo medical imaging techniques is often challenging due to the lack of appropriate reference data and the validation method may lack an appropriate reference. This paper evaluates a validation method using simulated MR image data. This provided an appropriate reference and allowed different error sources to be studied independently and allowed evaluation of the method for various signal-to-noise ratios (SNRs). The geometric bias error was between 0– voxels while the noisy magnitude MR image simulations demonstrated errors under 0.1161 voxels (SNR: 5–35). The body responds to mechanical loading on several timescales (e.g., [1, 2]), but in vivo measurement of critical parameters such as muscle load, joint reaction force, and tissue stress/strain is usually not possible [3, 4]. In contrast, suitably validated computational models can predict all of these parameters, and they are therefore a powerful tool for understanding the musculoskeletal system [4, 5] and are in use in diverse applications from impact biomechanics [6, 7] to rehabilitation engineering [8, 9], surgical simulation [10, 11], and soft tissue drug transport . Skeletal muscle tissue in compression is nonlinear elastic, anisotropic, and viscoelastic, and a constitutive model with very good predictive capabilities for in vitro porcine muscle has been proposed [13, 14]. However, validating this model for living human tissue presents significant difficulties. Some authors have used indentation tests on skeletal muscle [15, 16], but the tissue was then assumed to be isotropic and linear in elastic and viscoelastic properties. In contrast, noninvasive imaging methods that allow detailed measurement of human soft tissue motion and deformation (due to known loading conditions) combined with inverse finite element (FE) analysis allow for the evaluation of more complex constitutive models. The work presented here is part of a study aiming to use indentation tests on the human arm, tagged Magnetic Resonance (MR) imaging and inverse FE analysis to determine the mechanical properties of passive living human skeletal muscle tissue using the constitutive model described in [13, 14]. Recently the potential of using surface deformation measurements from 3D digital image correlation to assess mechanical states throughout the bulk of a tissue has been shown . However MR imaging combined with deformation tracking techniques can provide 3D deformation data throughout the tissue volume and is ideal for the evaluation of constitutive models such as [13, 14]. MR imaging has been used to study skin , heart , and recently also rat skeletal muscle  (though a simplified Neo-Hookean model was applied). The techniques for tracking tissue deformation from (e.g., tagged) MR imaging are complex and require validation using an independent measure of deformation. Since physically implanting markers is not feasible and anatomic landmarks are either absent or difficult to track, alternative methods have been employed. Young et al. recorded angular displacement of a silicone gel phantom using tagged MR images and evaluated the results using FE modelling and 2D surface deformation derived from optical tracking of lines painted on the phantom surface. Similarly, Moore et al. used optical tracking of surface lines on a silicone rubber phantom to validate MR-based deformation measures. However simple tensile stretch was applied and only a 2D measure of surface deformation was used. There were also temporal synchronisation issues between the optical and MR image data. In both of the optical validations studies above the error related to the optical tracking method was not quantified. Other authors have used implantable markers. For instance Yeon et al. used implanted crystals and sonomicrometric measurements for validation of tagged MR imaging of the canine heart. However the locations of the crystals were verified manually by mapping with respect to surface cardiac landmarks in the excised heart and matching problems between MR and sonomicrometric measurements occurred. Neu et al. [24, 25] evaluated a tagged MR imaging-based deformation tracking technique for cartilage using spherical marker tracking in a silicone soft tissue phantom. However the marker centres were determined by manually fitting a circle to each marker in two orthogonal directions and imaging was performed on excised tissue samples at high resolution (over 32 voxels across marker diameter) using a nonclinical 7.05T scanner. This paper shows that validation of in vivo medical imaging techniques and image processing algorithms is challenging partially due to the lack of appropriate reference data. Although experimental validation methods using soft tissue MR imaging phantoms can be developed, the data derived from these often suffers uncertainties similar to those present in the target soft tissue. Therefore the validation method itself often lacks an appropriate reference. In this paper a novel technique for the validation of a 3D MR imaging-based motion and deformation tracking technique, applicable to 3D deformation, is presented. The validation method, based on marker tracking, was evaluated (and validated) using simulated magnitude MR image data because this allows full control and knowledge of marker locations and thus provides the final real "gold standard.'' It addition this allows for the independent analysis of geometric bias and of method performance across a wide range of realistic noise conditions. The proposed validation configuration is an MR compatible indentor used to apply deformation to a phantom and provides an independent measure of deformation allowing validation of MR imaging-based motion and deformation tracking. A silicone gel soft tissue phantom was developed to represent deformation modes expected in the human upper arm due to external compression (see Figure 1), as such the phantom resembles a cylindrical soft tissue region containing a stiff bonelike core. The gel (SYLGARD 527 A&B Dow Corning, MI, USA) has similar MR  and mechanical  properties to human soft tissue and has been used in numerous MR imaging-based studies on soft tissue biomechanics [21, 24, 27–34]. Embedded in the gel are contrasting spherical polyoxymethylene balls of mm diameter (The Precision Plastic Ball Co Ltd, Addingham, UK). The lack of signal in the markers in comparison to the high gel signal allows tracking. (a) An MR image of a gel region with markers, (b) a tagged MR image region, and (c) the silicone gel soft tissue phantom containing the spherical markers (white balls). The type of image data used in the current study is T2 magnitude MR images. Deformation can be measured using marker tracking methods applied to full volume scans taken at each deformation step. A full volume scan was performed on the tissue phantom using a 3T scanner (Philips Achieva 3T, Best, The Netherlands). Cubic 0.5 mm voxels were used and the data was stored using the Digital Imaging and Communication in Medicine (DICOM) format. Figures 1(a) and 1(b) show an example of an MR image and tagged MR image of a region of the phantom. The voxel intensities of the images are 9 bit unsigned integers with values ranging from 0 to 511. The data was imported into Matlab 7.4 R2007a (The Mathworks Inc., USA) for image processing. The image data was normalised producing an average gel intensity of 0.39, while the marker intensity was zero. To track the movement of markers from the 3D MR data an image processing algorithm was developed in Matlab (The Mathworks Inc., USA). The centre point of each marker at each time step can be found using 3 main steps: masking, adjacency grouping, and centre point calculation. Here all of the first six mask voxels (indicated with ), of the mask coordinate collection , represent the central cross-elements and the last six (indicated with ) represent the outer elements (see Figure 2(a)). Depending on the marker appearance in the image (see next section) up to 8 central marker voxels match this criterion and were found per marker. (a) The cross-shaped mask, (b) the adjacency-based grouping process, (c) a 3 mm diameter sphere placed at the calculated marker centre. The ACG contains all the directly adjacent voxels of the voxel (its direct upper, lower, front, back, left, and right neighbours). Any voxel with coordinates is added to the marker group when its intensity is lower than and its coordinates are found within one of the ACGs of the marker . When a voxel is added to the marker group its ACG is added to the set of ACGs belonging to and this process is repeated. Voxels are added to a marker group until the group is no longer growing. Figure 2(b) shows how, starting with one central voxel, the surrounding low intensity voxels within the coordinate group are added and when this is repeated all voxels representing the marker are grouped. After grouping, the dimensions and number of voxels of the object were compared to what is expected for normal markers (e.g., a diameter of under 6 voxels and consisting of under 250 voxels) to filter out possible objects other than markers. Here represents a threshold which for a noiseless image could be set equal to the gel intensity (the weight then represents the volume fraction of marker material present in the voxel). The condition is added that when is larger than the weight . The marker tracking method was evaluated using simulated magnitude MR image data because this allows full control and knowledge of marker locations and thus provides the final real "gold standard.'' The simulated data also allow one to isolate and study errors from different sources. The marker tracking method was evaluated using algorithms developed in Matlab (The Mathworks Inc., USA) and involves the following steps: simulation of a noiseless image and analysis of geometric bias, and simulation of noisy magnitude MR data and analysis of the noise effects. The final noisy image data allows one to evaluate the performance of the method under varying noise conditions while the noiseless image allows for evaluation of the geometric bias implicit in the method. (1) Simulation of a Noiseless Image and Analysis of Geometric Bias. Since the marker image intensity values are zero, image data were simulated by multiplying an image representing gel volume fractions by the average normalised gel intensity. A 3D image space can be defined containing only markers and gel and can be expressed as a continuous binary function , where for all marker coordinates and for all gel coordinates. When this function is represented across voxels intermediate intensities arise as averaging occurs at each voxel where intensity is equivalent to the gel volume fraction within the voxel. The continuous binary function can however be approximated by a high-resolution binary image. Simulation of a volume fraction image at the desired (lower) resolution (cubic 0.5 mm voxels) then involves simple averaging of the high-resolution representation. High-resolution binary images were created at 25 times the acquisition resolution. A 2D mid-slice of a high-resolution (cubic 0.02 mm voxels) binary image is shown in Figure 3(a). At this resolution the marker sphere is represented by over 1.7 million voxels and the volume is represented with less than 0.07% error. Figure 3(b) shows the corresponding volume fraction image at the averaged acquisition resolution (cubic 0.5 mm voxels). By multiplying the obtained volume fraction image with the appropriate gel intensity (average normalised intensity 0.39) a noiseless simulated image is obtained. (a) A high resolution (uniform 0. 02 mm voxels) binary mid-slice image of marker, (b) corresponding mid-slice at the MR acquisition resolution (uniform 0.5 mm voxels). The appearance in Figure 3(b) is symmetric because the marker centre point coincides with a voxel corner. However the appearance of objects in images varies depending on their location due to averaging across the discrete elements, in this case voxels, which leads to a geometric bias affecting the marker tracking method. Figure 4(a) shows a marker sphere and the voxel in which its centre point is found. This voxel is named the Object Central Voxel (OCV) (see also Figure 4(b)). When a marker centre point coincides with the centre of its OCV appearance 1 is obtained. Similarly 2 up to 4 demonstrate the appearance of a marker when its centre coincides with the middle of a voxel face, the middle of a voxel edge and a voxel corner, respectively. Obviously when a marker is moved exactly one voxel in a certain orthogonal direction its appearance has not changed but simply shifted. In fact each of these appearances is either symmetric or equivalent to several other appearances obtainable through varying location within the OCV (e.g., each voxel corner produces the same appearance while mid-edge appearances can be obtained through rotation and mirroring). 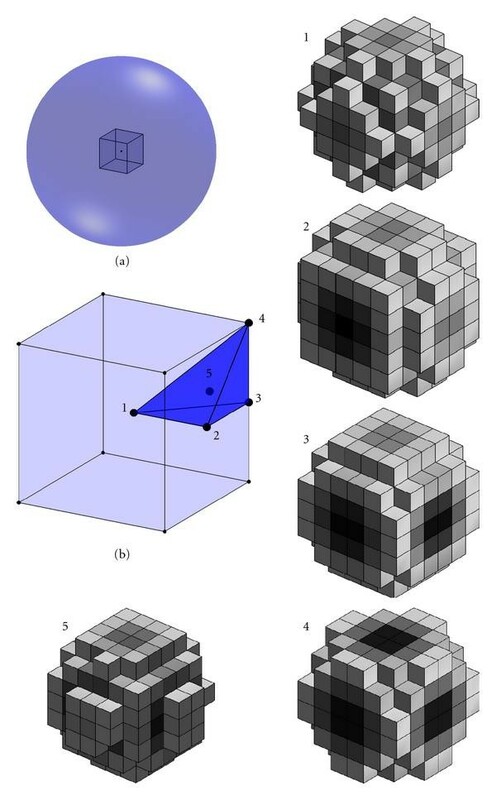 Thus when the spherical markers (or any other symmetric shape) are averaged across a cubic voxel matrix the appearance varies uniquely within the blue tetrahedron shown in Figure 4(b). All other appearances can be obtained by rotation and mirroring of the appearances in this tetrahedron. Appearances 1–4 are the most symmetric appearances obtainable. Other appearances however can be asymmetric such as case 5 which is obtained when the marker centre coincides with the centre of the tetrahedron. Since the centre point calculation in the marker tracking method is based on an average of marker voxel coordinates, it is sensitive to symmetry of the marker appearance and as such the error is also related to asymmetry. (a) A marker sphere showing OCV. (b) An OCV showing the tetrahedron in which the appearance of markers varies uniquely. The most symmetric appearances are 1 mid voxel, 2 mid face, 3 mid edge, and 4 voxel corner. Appearance 5 is in the middle of the tetrahedron and shows the resulting asymmetric appearance. It was hypothesised that since OCV points 1–4 in Figure 4 produce symmetric appearances the error here is low and that locations furthest away from these symmetries produce the worst error. If this hypothesis is true the error would follow a pattern similar to that shown in Figure 5 (a distance plot from the grid defined by the corner, mid-edge, and middle points) and assuming that each point has the same symmetry "weight,'' the worst error should occur in the middle of the longest edge of the tetrahedron. (a) A 3D plot representing the full OCV showing the expected type of geometric bias pattern, and (b) a 2D equivalent. The geometric bias was investigated by simulating markers with their centre points coinciding with various locations within an OCV in the absence of noise. Due to the symmetry in the appearances as discussed above, simulations were performed in 1 octant of the OCV only using a grid of points. For visualisation purposes the results were then mirrored to obtain bias measures across the full OCV (similar to Figure 5(a)) producing a grid. A finer grid was then applied around the maximum bias to closely approximate the location of the real maximum bias. This process was repeated until the found maximum no longer varied significantly. Using this equation, and analysis of the background of a normalised T2 MR image of the silicone gel phantom, was estimated to be 0.02. Based on the average normalised gel intensity of 0.39 this corresponds to an SNR of 19.5. However, to evaluate the performance of the marker tracking method in the presence of noise, images were simulated at the worst location found by the geometric bias at a SNR of 5 up to 35. Simulations were performed 10 000 times to obtain an estimate of the error distribution at the various SNR levels. The Rician PDF at various ratios (0–6). 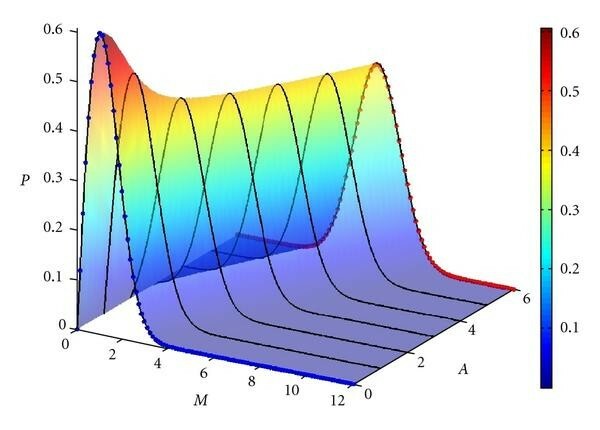 When the Rician PDF reduces to the Rayleigh distribution (blue dots) however as increases to over the Rician PDF behaves approximately Gaussian (red dots at ). The results are presented in two steps: evaluation of the geometric bias in the marker tracking method, and evaluation of the performance on the marker tracking method in the presence of noise. (1) Evaluation of the Geometric Bias in the Marker Tracking Method. Figure 7(a) shows the geometric bias error in the absence of noise in an Object Central Voxel (OCV). The colour in each element is the error (in units of voxels) of the marker tracking method for each point on the 3D grid. Figure 7(b) shows 2D image slices through Figure 7(a) showing the best and worst locations . Analysis demonstrated that overall the geometric bias of the marker tracking method ranges from 0 to a maximum of (with a mean of and a standard deviation of ) voxels. The error is 0 for the symmetric cases (1–4 in Figure 4) while the maximum error occurs in locations where a marker centre point coincides with 1/1.368th or 1/4.329th of a voxel; see, for example, white points in Figure 7(b) (e.g., at ). (a) The OCV showing the error of the marker tracking method, each grid locations tested. (b) Three 2D image slices through the OCV for the best (Slice 1 and 2) and worst locations (Slice 3). (2) Evaluation of the Performance on the Marker Tracking Method in the Presence of Noise. The performance of the marker tracking method for the noisy magnitude MR image simulations obtained from the 10 000 simulations at each SNR of 5 up to 35 is presented next. As the SNR increases from 5 to 35 the maximum, mean and minimum voxel errors vary according to Figure 8(a). The standard deviation is plotted in Figure 8(b). Although for the maximum stays below 0.1127 in all cases, the method performs better when is chosen depending on SNR. To illustrate this Figure 9 shows results for the SNR range 15–35 using . Using a higher means that the marker groups are composed of more voxels and thus a more accurate centre point can be calculated. The maximum voxel error for at an SNR = 19.5 (estimated SNR level) is voxels; however using a in this case results in a more threefold increase of the accuracy as the maximum error is reduced to voxels. The optimum value for a certain SNR can be determined using MR data simulations. Using simulations the error can be minimised for a given SNR by adjusting the value. Results for SNR 5 up to 35 using T = 0.26. (a) The maximum (red dotted line), the mean (blue crossed line), and the minimum voxel error plotted against SNR, and (b) the standard deviation plotted against SNR. Results for SNR 15 up to 35 using T = 0.32. (a) The maximum (red dotted line), the mean (blue crossed line), and the minimum voxel error plotted against SNR, and (b) the standard deviation plotted against SNR. Several MR imaging-based motion tracking algorithms have been proposed in the literature, for example, tagged MR imaging  and phase contrast MR imaging , but these all rely upon validation of the algorithms proposed. A review of the literature showed that the validation methods used for existing techniques are frequently incomplete, and this paper presents a novel validation method for MR imaging based on motion tracking using a marker tracking algorithm which itself is validated against simulated MR image data. Simulated data was generated for the noise-free case as well as for a variety of different Rician distributed noise levels. The noise-free image data allowed analysis of the error related to the geometric bias independently from other error sources. Therefore the method proved to be robust with geometric bias errors of between voxels and errors due to noise remaining below 0.1127 voxels for all cases simulated with signal-to-noise ratios from 5 to 35. These results were achieved for a global threshold value . However altering the threshold value based on the SNR may result in a significant increase in accuracy. The optimum value for a certain SNR can be determined using MR data simulations. Using simulations the error can be minimised for a given SNR by adjusting the value. The method proposed in this paper has two main advantages. The first is that the data used for validation is simulated and therefore can be chosen to have desired levels of noise. This permitted evaluation of the marker tracking method for different levels of noise which has not been done previously. Secondly, since this validation method is based on MR imaging, the marker tracking experiment and the MR imaging-based motion and deformation tracking can all be performed at the same time within the MR scanner. Although this method has been developed for application to tagged MR imaging on the upper arm, the methods presented here are not limited to this application and can be applied to validate other types of MR imaging-based motion and deformation tracking techniques. Furthermore, these methods are independent of the chosen phantom shape. This work was funded by a Research Frontiers Grant (06/RF/ENMO76) awarded by Science Foundation Ireland.